Come celebrate our familia at our annual banquet! This is a time where we will award our members who have highlighted our five pillars this last semester and to also wish our graduating students the best of luck on their endeavors! Come hear from the founder of SHPEhimself, Rodrigo Garcia as well as enjoying dinner with our generous company sponsors. We would love to see you there, purchase your ticket here! If you have any fun, wholesome & “familia-friendly” pictures/videos from this year with your favorite SHPEsters, upload them here! We’ll be adding them to a slideshow for our banquet at the end of the year. Established in 1975, SHPE-USC became one of the first student chapters in the nation. Since then, this organization has broken boundaries and defied stereotypes through continuously developing Latino/a student leaders who later become prominent professionals in their respective fields. 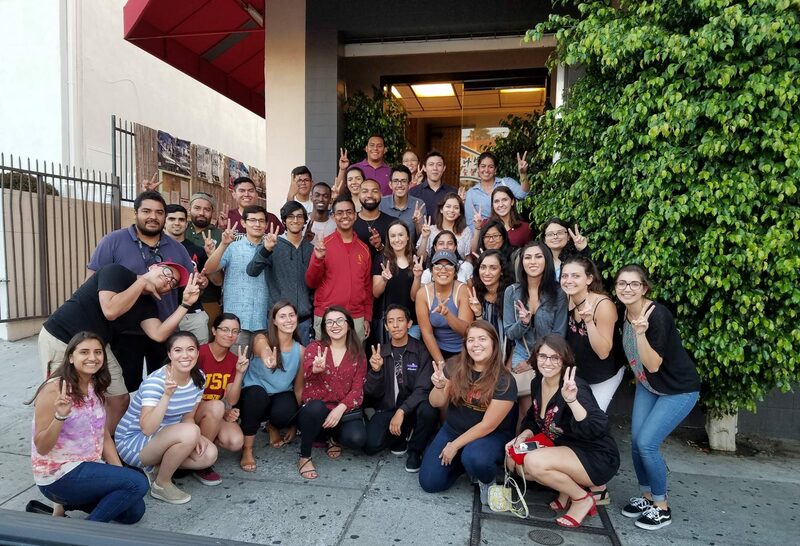 SHPE-USC strives to provide an infrastructure which emphasizes chapter development, community outreach, leadership development, professional development, and academic integrity. Our members function as role models within the classroom, the USC community, and their own communities across the globe. It is our goal to motivate and inspire future generations by tackling the challenges faced by under-represented Latinos/as in STEM fields. The success of SHPE-USC has grown due to the dedication of its members and executive board. Commitment is the key factor behind such SHPE-USC awards, namely: Viterbi Student Organization of the Year in 2006, SHPE National Blue Chip Chapter Award in 2006, Chapter of the Month Award for September and January of the 2009-2010 school year, the Latino Student Assembly Community Outreach Award in 2009, and the SHPE National Blue Chip Chapter Award in 2011, 2012, 2015 and 2017 and the Latino Student Assembly Organization of the Year Award in 2012 and 2017. In addition, we are ranked #3 in SHPE National for Membership Growth out of 234 chapters. To stand as a presence that is admired for its development of Latino/a engineers as influencers and leaders at the University of Southern California and surrounding community. To provide SHPE-USC members with exposure to industry representatives, alumni, and resources to develop professionally throughout their career at USC and better prepare them for a career after college. This will be accomplished through guest speakers, the SHPE and HENAAC Conferences, Corporate Tour Series, and networking events. Success will be measured through internship and career success rates and conference participation. To encourage and support academic excellence among SHPE-USC members. This will be encouraged through exposure to campus academic resources, peer mentoring and tutoring, award recognition, and resources for graduate school. Success rates will be measured through GPA standing, USC and Viterbi recognition rates, increased graduate student membership, graduate school application and acceptance rates. To help establish strong relationships among members of SHPE-USC in order to foster a network of support where members will benefit from peer exposure and resources. Events will mainly be informal, located on and off-campus, and will range from encouraging group interaction at meetings to group outings. Success will be measured through meeting and event attendance, and membership retention rates. To provide guidance and mentoring to underrepresented students in grades K—12 at local community schools. This semester, our community outreach will take the form of SHPE/LBSA youth Conference with local middle schools, and Discover Engineering Day with Manual Arts, Fremont, and Foshay High Schools. Success will be measured through college acceptance and attendance rates as well as increased interest in science, math, engineering, and higher education.